Termites are something that no home owner wants to even think about. Silent, sneaky eaters of wood, termites can cause massive damage to one of your biggest investments in life. They're not alone in this sort of destruction, however, so there are other wood destroying pests that Z Pest can help you with (commonly referred to as "Wood Destroying Organisms," or "WDO" for short), such as carpenter ants, wood boring beetles, fungi, etc. When termites strike around here, they do so from below: this region of the country is host to the subterranean variety of termite, one that lives beneath the soil. In some ways, this makes them easier to treat and to prevent. 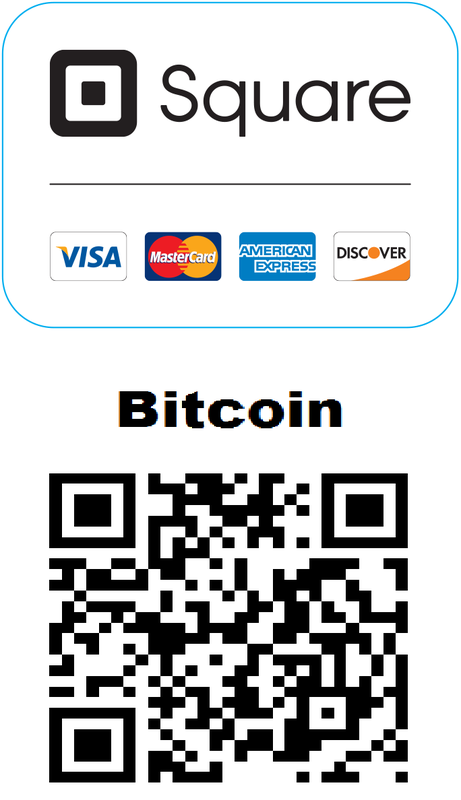 But it also makes them more difficult to detect. Treating termites begins with their detection, which can be before an inspection for them, or during one. Many times this takes place when a home or other type of building is being offered for sale (PLEASE NOTE: I do not perform inspections for any sort of real estate transaction, only for the identification of and remedy of wood destroying pests; my inspection cannot be used for any other purpose). Other times termites are found while repairs and additions are being performed on a building. Every now and then, someone just happens to notice their presence by chance, too. 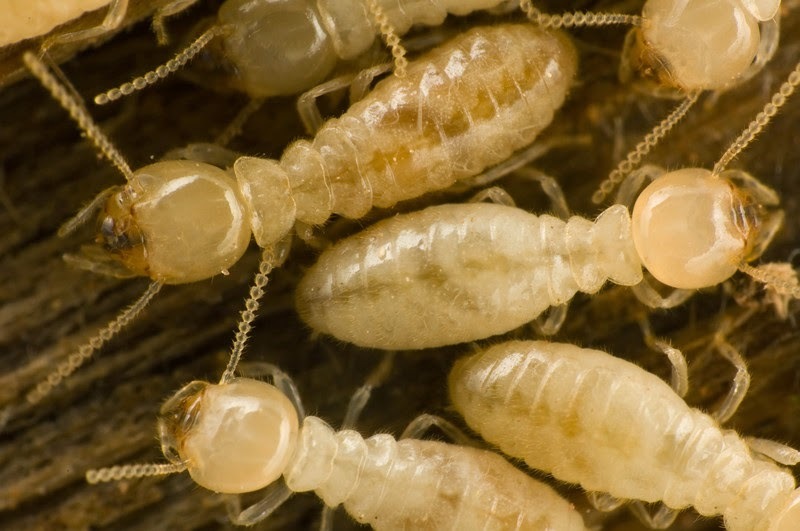 The subterranean termites found in this area can almost be described as "little grains of white rice." Some are a bit larger and can have darker heads (the soldiers), and occassionaly young, winged "reproductives" are seen, which could give rise to new termite colonies. If you are ripping away walls or flooring, or if you move something heavy that has been sitting outside near your home or office and you see tiny, white, wingless insects run for cover, you should probably have an inspection done. The other way you're likely to spot subterranean termites is by their "mud tubes," structures termites create to shelter themselves from outside air, keeping them in the moist environment of their subterranean habitat that their fragile bodies require. Sometimes you will see these on the outside of a structure, but very often they'll be located in hidden places, such as behind kitchen drawers, behind drywall, or in the crawlspace underneath your home. If you see a mud tube, it would be a very good idea to call for an inspection. If you suspect that you have termites, I can perform an inspection to verify their presence, determine the extent of the damage, and prescribe treatment for them. This is done in, around, and even under the structure. You will receive a report of findings complete with a sketch of the affected building indicating where evidence of termites was found. There is a fee for this inspection, but typically it can be deducted from the cost of treatment if you decide to have one performed. Generally, it is best that termite-damaged wood be replaced before treatments are performed. The reason for this is that subterranean termites do not live in the wood they are consuming, but down in the soil below it where treatments will be directed. After the termite colony has died from the treatment, the evidence of their presence will remain, which can cause a number of problems in the future (particularly if you later decide to sell the building, as a future inspector must then note the evidence of a termite infestation). If repairs are made after the treatment is performed, there is a chance that the repair work will disturb the treatment and create a gap that termites can exploit. I can refer you to a few contractors I know personally, some of whom have done work on my own property (I do not receive any sort of fee or other compensation from them for these referrals). 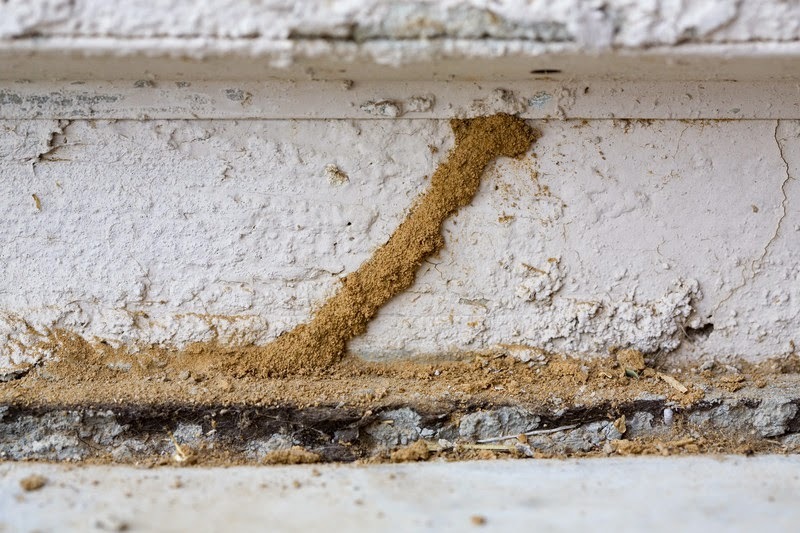 For the variety of termite found around these parts, long-lasting residual chemicals are injected into the soil around and underneath the infested structure. The reason for this is that subterranean termites must maintain a link to their nest underground, so as they travel back and forth from the nest to the wood they are feeding on, they will encounter the treated soil and be killed. To accomplish this, chemical is injected around the interior and exterior perimeters of the structure, and around any columns or supports underneath it. A variety of techniques are used to accomplish this, including drilling through concrete to reach the soil underneath. Once this is done, drill holes are filled and cemented over, soil is filled back into trenches, and you then have a protective barrier around and under your home that will destroy entire termite colonies that come into contact with it for years to come. Unfortunately, termite control does not come cheap. It is very common for this kind of work to total in the thousands of dollars, not including any repair work a building contractor may need to separately perform. It can also require you to temporarily move furniture and other things out of the way so the treatment can be done. However, termites can cause much more in damages than the work could cost, and they could potentially rob you of your home or office. It is very worth it to put in the time, effort, and money to get rid of them. If you think you might be faced with this destructive pest, please do not hesitate to call. The sooner you get help, the sooner they'll be gone and not causing further damage.